Have you ever dreamed of doing something in television production? Are you tired of working just phone jobs? Are you an accurate typist? If so, keep reading about the exciting opportunity to become a freelance captioner at Ai-Media. Ai-Media is a company that hires freelance captioners to work on the captioning for television, movies, YouTube videos, and other sources of production which need captioning. Ai-Media provides the captioning platform and all of the tools, so you will not have to purchase your own captioning software. Almost anyone who has cable has heard of closed captioning. It is the text at the bottom of the screen that appears when someone in the video or movie is talking. Closed captioning is not only used for those who are hearing impaired, but also for those whose native language may not be English. Closed captioning can also be turned on or off by the viewer; whereas, open captioning cannot be turned off. With locations in the United States, the United Kingdom and Australia, Ai-Media operates with the belief that every piece of content should be accessible to everyone – one word at a time. 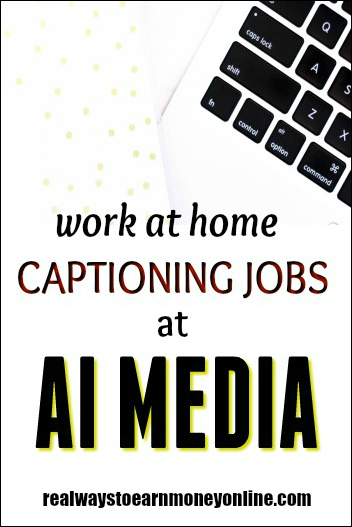 What Special Skills Do You Need to Become a Captioner at Ai-Media? The main skill is to have a good command of the English language both formally and colloquially. Then you should be able to type the time length of the clip or screen, so that the piece flows smoothly from one screen to the next. If you like transcription, then this might be something else for you to try. Outside of a good command of the English language, you will need a computer and Internet connection. How Long Is Training For You to Become a Captioner at Ai-Media? Training is usually only one day for about 4 to 6 hours. It is fast paced and there is a lot to learn. Training is unpaid, but most do find the work and the training interesting. How Much Can You Make as a Captioner at Ai-Media? Their website states that you can make $27 to $42 per video hour. Now, a video hour is not the same as an actual hour (60 minutes). For every video hour you commit to, you will put in approximately a total of about three hours for the typing, editing, research, and replay. The good news is that you can set your own hours and work around any other commitments or work-at-home jobs that you may have. Does Ai-Media Hire Outside of the United States? Yes, as well as the United States, Ai-Media employs people throughout the United Kingdom and Australia. As for hiring in other countries, they currently are not hiring outside of the three previously mentioned. What Do Others Say About Ai-Media? The reviews on Glassdoor are mixed. There are the not-so-good reviews that complain of the low pay and lack of training, and then there are the good reviews on that rave about work enjoyment and flexibility. As always, read them for yourself and decide if this opportunity is for you. How Would An Interested Individual Apply at Ai-Media? Simply go to their website and click on the apply here button. Make sure that you take the time to read the “Terms and Conditions” at the bottom of the application page as you would do for any work-at-home job. P.S. – Want to be taught how to do general transcription? Then you might want to check out this reputable eCourse that teaches you exactly how to do the work (increasing your chances of getting hired by just about any company) and how to begin making money. The self-paced intro course lasts for seven days and is free! Ai Media is a horrible company to work for. The pay is VERY little. When an employee actually gets a handle on captioning and can complete the work faster, they tend to stop everything so that they don’t have to pay you. You will waste many hours trying to caption poor quality videos for peanuts. Warning! Thanks for letting us know, Jane. I just try to be objective and just report, but I always stress the importance of checking Glassdoor or Reddit reviews. It also never hurts to ask around and see if anyone has worked for a company. This is why it is so great when people like you share their experiences. Sometimes it is just as important to know which companies to avoid as well as maybe which ones might work. Sometimes two people can work at the same company and have a totally different experience. @Cori – Good to hear from you. Yes, readers always want those non-phone jobs! This one even has me itching to try.